Heavy Duty Metal 5 Tier Boltless Shelving Racking For Home Shop Warehouse Storage. 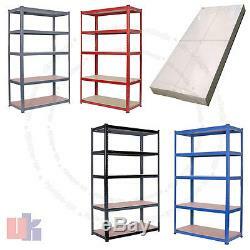 The 5 Tier Garage Shelving Storage Unit Is High Quality. Use The Heavy Duty Steel Make Shelving Units Strong. Suitable For Garages, Workshops, Warehouses, Or In The Room. Boltless Can Connect Multiple Bays Together. Each Solid Mdf Boards Thick 5mm. 1500mm (Height) x 700 mm (Width) x 300mm(Depth) Available Colours = Blue / Black / Red / Grey 100% BRAND NEW Quick & easy tap together assembly Industrial grade shelving with 5 shelf levels per bay Superstrong MDF board and heavy duty steel powder coated Dimensions: 1500mm (Height) x 700 mm (Width) x 300mm(Depth) Unit can hold 175Kgs when evenly distributed Quality Shelving and Quick Dispatch Blue 1800 x 900 x 400 mm Industrial grade shelving with 5 shelf levels per bay. Each Bay has a 1800mm (Height) x 900 mm (Width) x 400mm(Depth). Each shelving can hold 175Kgs. Blue 1800mm x 900 x 450 mm Industrial grade shelving with 5 shelf levels per bay. Each Bay has a 1800mm (Height) x 900 mm (Width) x 450mm(Depth). Blue 1800 x 1200 x 400 mm. Industrial grade shelving with 5 shelf levels per bay. Each Bay has a 1800mm (Height) x 1200 mm (Width) x 400mm(Depth). Each shelving can hold 275Kgs. Blue Shelving Racking Bay Connector Clips Connect multiple racking bays together for extra stability. Compatible with with any shelving units in our shop. Bays and great for joining workbenches together. There are 6 bay connector clips per pack. If there is any heavy item, we will use different courier service like: - Yodel, Parcelforce, UKMail. It depends on the post-code and which courier has best service there. In case of additional surcharge, we will contact you. If you are outside UK mainland you can ask invoice in advance. We will provide the best customer services to handle your query and resolve it ASAP, all of your massages will be answered in timely manors. We always try to dispatched the item ASAP, if you like the item to be delivered on different address please update the address before you press the pay button, option is available to change/add new address. We guarantee you, once you use our services you will always come back. It is safe for you to pay via Pay Pal. You can use 4.74A instead of 3.42A and it will not harm the laptop, as laptop uses only what it requires. If require any help please use, ask question option and send us a message. In any circumstances our maximum liability will not exceed more then the original price paid. If item does not turns up with in above estimated times, please inform u. The item "Heavy Duty Metal 5 Tier Boltless Shelving Racking in Blue Red Black Grey Colours" is in sale since Saturday, July 8, 2017. This item is in the category "Business, Office & Industrial\Retail & Shop Fitting\Shelving & Racking". The seller is "ukedeals" and is located in northolt. This item can be shipped to United Kingdom.